We require you to read and agree to our Vendor Guidelines and gather necessary information prior to submitting an application. 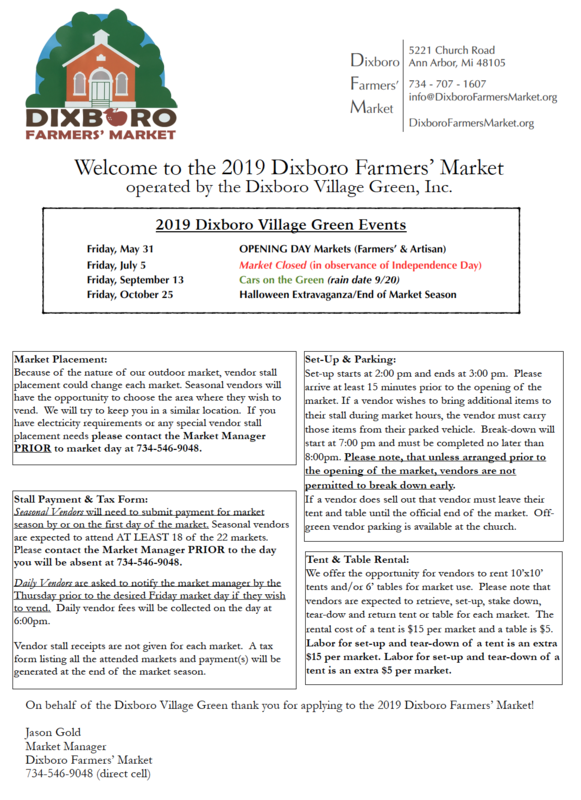 Applications to vend at the Dixboro Farmers Market are accepted through this online application only. The process will take about 5 minutes. Full payment prior to vending is required to be accepted as a Seasonal Vendor. Farmer Crafts are items crafted from food crop grown or managed on OWN land. For example, beeswax candles from honeybees or milk soap from diary animals. Vendors specializing in non-farm craft is welcome to apply to the Dixboro Artisan Market, held the last Friday of each month. ​or download file at bottom of this Application.